Technically, Ovation of the Seas just sailed around the world without a name. 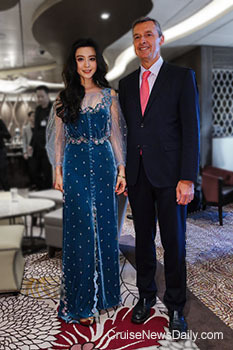 It arrived at Tianjin this morning at the end of its 54-day positioning cruise from Southampton, and this afternoon it was officially named at the Chinese port by its godmother, Chinese actress Fan Bingbing. Crystal Serenity passing US Coast Guard compliance tests it will need for its historic Northwest Passage voyage from Seward to New York in August. Staffers at Carnival's UK headquarters in Southampton are worried their jobs will be affected with a shift of some of them to Germany in September. We also have a step-by-step guide to how Koningsdam was built. 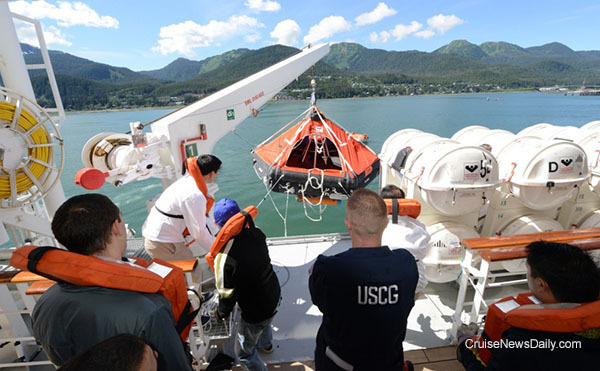 Coast Guard inspectors observe crew members aboard Crystal Serenity as they test the capabilities of a crane and the hydrostatic release life raft in Juneau on Wednesday. Photo courtesy of US Coast Guard. All rights reserved. May not be copied or used without permission. Last month four women went on a cruise that was paid for by some man none of them really knew - a friend of one of the women's sister. When they returned, they were all arrested for carrying packages of cocaine in their underwear. The incident is now coming to light because it's finally coming into the court system. Beyond just the curiosity factor of this case, it does bring up a frightening point about the cruise ship and even our Customs and Boarder Protection, however. The complete story appeared in the June 23 edition of Cruise News Daily. Crystal River Cruises' first river ship, Crystal Mozart, will be named in Vienna on July 11. Ms. Elisabeth Gurtler has consented to be the ship's godmother. Details appeared in the June 23 edition of Cruise News Daily. Passengers returning to Ft. Lauderdale's Port Everglades on Carnival Cruise Line and Royal Caribbean International this summer may or may not speed through US Immigration and Customs, depending on how well a couple of new electronic programs work. Port Everglades is the first US port to have the new programs, although versions are being tested in several airports. Details appeared in the June 22 edition of Cruise News Daily. A story began unfolding since Monday on the other side of the world down under in Port Vila, the capital city of Vanuatu. There was a tour bus accident in which 12 passengers from P&O Australia's Pacific Dawn were injured, 10 seriously. There were also a number of local people injured. The ship's doctor went to the scene to assist. The less seriously injured were taken back to the ship for treatment, and the more seriously injured were taken to a local hospital. That was just the beginning of P&O's caring for their customers. The complete story appeared in the June 22 edition of Cruise News Daily. Princess Cruises has come up with a promotional fare they announced today that caught our attention. We don't normally cover pricing promotions because there's always some promotion or reduced rate running, and it's not really news. Occasionally, one comes along that there's more significance to, and Princess' seems to be a bit different. It's different because it includes some things of significant value, things that most people purchase anyway, and they truly don't appear to be adding to the cost. Details appeared in the June 21 edition of Cruise News Daily. If you are sailing out of the Port of San Diego, you can pat yourself on the back that you have a smaller carbon footprint than if you had sailed out of most other cruise terminals. The port is installing 630 solar panels on the roof of the B Street Cruise Terminal, the port's primary cruise terminal. The complete story appeared in the June 21 edition of Cruise News Daily. When Norwegian Dawn sails out of Boston to Bermuda, it has a lot of repeat passengers. When they board this summer, they will hardly recognize the ship. It just returned from its month-long Norwegian Edge renovation, and the line says they virtually rebuilt the ship. Norwegian says the ship received enhancements to every part of the onboard experience. During the refit, two new restaurants were added as were three new bars and lounges, and all public spaces were updated. At the same time, all staterooms were refurbished, and the luxurious Garden Villas received complete makeovers. The complete story appeared in the June 20 edition of Cruise News Daily. 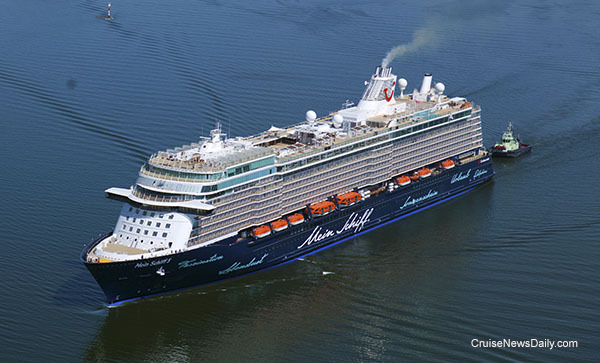 Meyer Turku delivered Mein Schiff 5 to TUI cruises on Monday, ten days ahead of schedule. The 99,800-ton vessel will leave Turku (Finland) Tuesday afternoon headed for Kiel, where it will arrive on June 23. Details appeared in the June 20 edition of Cruise News Daily. 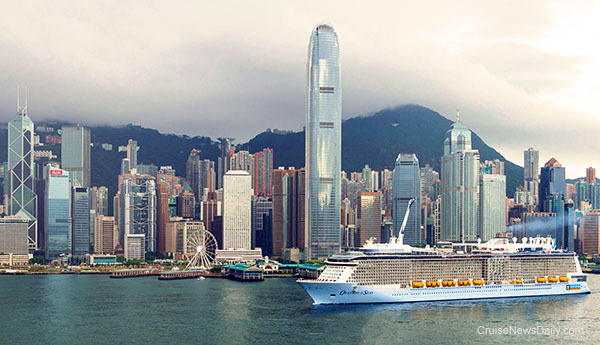 Royal Caribbean's Ovation of the Seas arrived in Hong Kong last Friday, its first Chinese port on its 52-day positioning cruise from Europe to Tianjin, where it will seasonally homeport during the Chinese summer season.